Under FASB’s forthcoming standard, revenue recognition will require more brainpower than ever. Today, Herz, who was FASB chairman until 2010, acknowledges that his characterization of the original deadline was an understatement. What led the board to set such an unrealistic agenda for itself? “That was the point of the highest focus on financial reporting in the history of our country,” recalls Herz, now an executive-in-residence at the Columbia Business School and a member of a number of boards and audit committees. Responding to the then-recent wave of accounting scandals and discussions about the soon-to-be signed Sarbanes-Oxley Act, Congress and the SEC were pressuring FASB to quicken what critics saw as its “glacial” pace of standard setting. Yet even as the SEC was pushing FASB to get a move on with its standards, its chairman, Harvey Pitt, was espousing the need for a convergence of standard setting between FASB and the International Accounting Standards Board. In the event, melding FASB’s grab-bag of prescriptive rules with the IASB’s slim set of principles for reporting revenue proved to be a long, arduous process, and the original timetable of 2 years eventually lengthened to 12. Fortunately, finance and accounting staffs working for companies that apply U.S. generally accepted accounting principles will have a fair amount of time to prepare if all goes as planned. While FASB expects to issue the standard in the first half of the second quarter of 2014, it would go into effect for public companies that have annual reporting periods beginning after December 15, 2016, and for private companies with annual reporting periods starting after December 15, 2017. Thus, for example, a public company with a reporting year beginning December 31, 2016, would have to recognize revenue according to the new standard on its quarterly statements starting with the first quarter of 2017, and on its 2017 10-K. 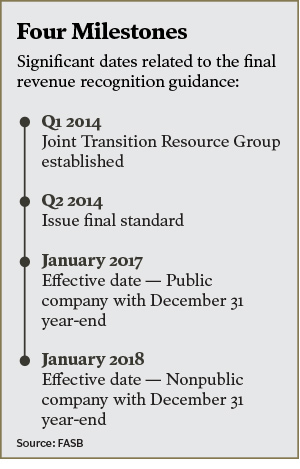 Nonpublic companies that have the same year-end as public companies would begin the process one year later. In other words, the changes will be so extensive that companies with complex revenue programs will need all that time to absorb them. At the heart of the proposed standard is a five-step process that will demand far deeper analyses than most companies are used to. To recognize revenue, a seller operating under a written, oral, or implied contract to provide goods or services to a customer will be required to (1) identify the contract with a customer, (2) identify the separate performance obligations in the contract, (3) determine the transaction price, (4) allocate the transaction price to the separate performance obligations in the contract, and (5) recognize revenue when or as it satisfies a performance obligation. If the contract, for instance, includes licensing and support for the customer as well as the sale of a product, the new model will complicate matters for certain sellers, according to George Victor, a partner with Giambalvo, Stalzer, a Great River, New York–based accounting firm. Unlike the current situation, each of those elements in many cases would have to be identified and valued under the standard—broken out rather than bundled. Similarly, the proposed requirement of gauging the transaction price creates at least one new complication: vendors will have to estimate uncollectible receivables at the start of the contract. Under current accounting, companies that don’t believe they’re going to collect on a receivable can simply not record the revenue, according to Victor. At the same time, if vendors expect to be paid, they can record that expectation. If, later on, the expectation changes, they can record a valuation allowance for the portion of the accounts receivable they feel they won’t collect. “You essentially record it after the fact,” explains Victor. By contrast, the new standard will require sellers to identify the credit risk up front. If a vendor has a contract for $1 million but believes that it’s going to collect only $900,000, “then that’s how much revenue [it] should be recognizing,” says Victor. Thus, under FASB’s proposal, the vendor would record a gross transaction price of $1 million and a $100,000 deduction, amounting to net revenue of $900,000 that would be recognized up front. Following the parsing of transaction prices and performance obligations in a multielement contract, vendors would have to match transaction prices to the separate performance obligations. At first blush, that seems like a lot of new estimates that companies will have to make before any obligation is performed or any money changes hands. It seems that way at second blush, too. Such estimates will require the human element. “There’s a lot of judgment there, and that’s not something that software can do by itself,” says Victor. CFOs, he adds, will need to enable their companies’ accounting systems to prompt employees to note changes in revenue estimates over the course of contracts. 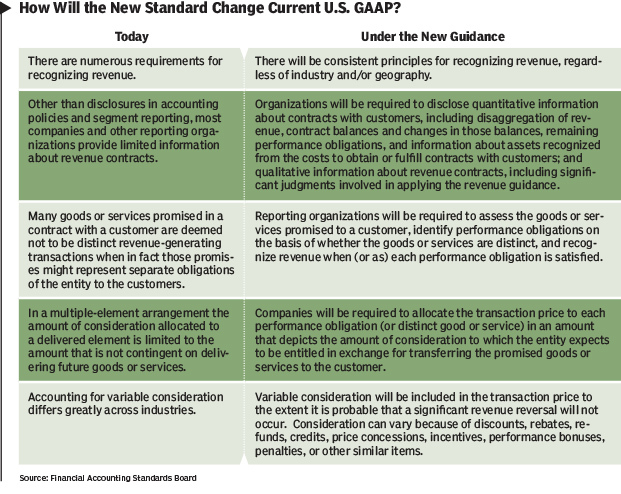 The proposed standard’s approach to “variable consideration” marks a sharp departure from U.S. accounting practice, according to Dusty Stallings, a partner at PwC. “Current U.S. GAAP for a number of U.S. industries would tell you that if the amount is not known, then you wait and record it when it is known,” she says. Under the new model, however, a company will be required to estimate its anticipated variable revenue “if it’s an amount that it believes would not get reversed in the future,” says Stallings. Because of its focus on such complex arrangements, the new standard won’t have much of an effect on retail and similar industries that involve simple cash-for-a-product purchases, accountants predict. On the other hand, pharmaceutical companies, construction contractors, real estate developers, auto companies, and other firms with multiple sources of revenue could have big adjustments to make if the standard is issued as expected. One Size Shouldn’t Fit All? 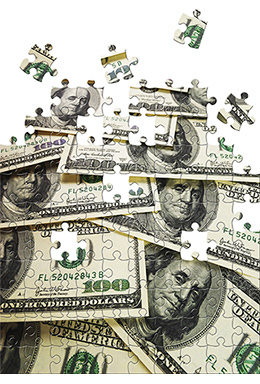 Many senior finance executives, especially those working in industries with well-entrenched revenue-recognition standards, feel that a single approach for all industries won’t be a good fit for many of them. Some, like James G. Campbell, controller of Intel, believe the costs of the winnowing-down simply won’t justify the purported benefits. In a March 13, 2012, letter to the boards responding to their revisions of a previous draft of the standard, Campbell argued that achieving the goal of improving the effectiveness of revenue-recognition disclosures “will require a framework that emphasizes decision-useful information over the current one-size-fits-all model.” The Intel controller went so far as to suggest that FASB had knuckled under to the IASB in stripping away well-established U.S. accounting guidance. With the time for such comments apparently over, however, finance chiefs might do well to start looking for ways the standard could help their companies—and themselves. Because it would force them to look more carefully at their employers’ revenue sources, it might help them price their individual products, services, and licenses more precisely, according to Mulford. “If that happens, it could be a revenue enhancer, as you start to look at more carefully at what you’re providing to your customer,” he says. If executives unearth services that need to be broken out separately, they might also consider increasing their prices, Mulford suggests. Does this affect not-for-profits who have long term service and performance contracts funded by government agencies?